For the next few weeks I will be participating in #cyberpd, a virtual book study group. You can find out more information about #cyberpd here. I am excited to take part in this community of educators for the second year. 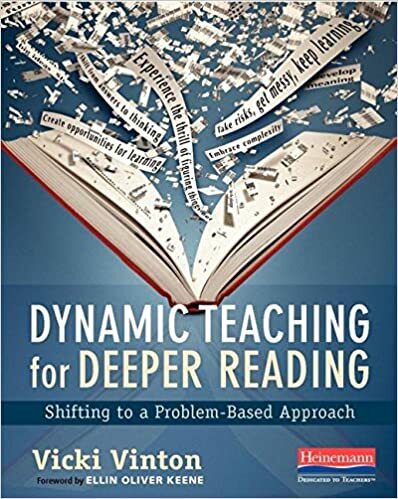 This year we are reading and discussing Dynamic Teaching for Deeper Reading: Shifting to a Problem-Based Approach by Vicki Vinton. I will be posting weekly reflections on the chapters we are reading. I am looking forward to learning from everyone in the #cyberpd community. Dynamic Teaching for Deeper Reading is a much needed book on reading instruction. Vicki Vinton mentions the Common Core State Standards within the book, but whether you teach in a state that has adopted the standards or not, you have probably crossed paths with educators, administrators, policy makers, or publishers who promote reading instruction that is oversimplified, prescriptive, and/or inauthentic. Vinton reminds us that reading is a complex process and because of this the instruction of reading is complex, even challenging and, at times, messy. Vinton makes the case for teaching a problem-based approach to reading, one in which readers are solving problems they face in their reading and figuring out for themselves who the characters are, what is happening, and what they author is trying to show them. This is an approach to reading instruction that mirrors the complex, messy process that real-world readers engage in. We shortchange our students when we scaffold students' learning by giving them shortcuts or "skillifying" reading. Readers make sense of a text as a whole. They reason, notice patterns, form ideas, and revise their thinking about a text as they read. Students should be immersed in this authentic work of readers. Overscaffolding results in readers who don't have to figure things out for themselves and therefore don't think as they read. We want readers to think! As students engage in a problem-based approach to reading they will also experience productive struggle, but this deep thinking is what will result in deep understanding. Much of today's reading instruction focuses on teaching students to extract from a text (analyze and find evidence to support claims), but reading is a process of transaction, in which readers engage their minds and hearts in making meaning. If we honor different ways of thinking, we promote not just critical thinking, but also creative thinking, thinking that is open-ended and changes as new information is encountered. In a problem-based approach to reading instruction, teachers model the complex thinking that is the reading process. Picking a favorite quote was difficult because there are many great statements in the book. I think the following quote is relevant to what we do as readers and what we want our students to do. I am currently reading Teach Like Finland:33 Simple Strategies for Joyful Classrooms by Timothy Walker because I am curious about education throughout the globe and want to know more about how students are taught in other places. I am reading Everybody's Son by Thrity Umrigar because her stories engage and move me, giving me a glimpse into someone else's life and showing me something about life, culture, and the human connection. Yes, there are times when my reading is more academic, such as when I take a course, but I read for so much more. I want the same for my students. I want them to read so they can fulfill their curiosities, make sense of the world, and change themselves. In order for students to do this, we need to show them that reading is about thinking and understanding. Thanks for your reflection. I relate to this line, "I want them to read so they can fulfill their curiosities, make sense of the world, and change themselves." If students don't read for this purpose, they will not become lifelong readers. If reading is only to fulfill an assignment or answer a set of questions, there is no lasting purpose. I enjoyed reading your reflection! The quote you pulled is an important one. Reading helps us navigate life- it's not school work but life work. I love how you highlighted creative thinking as well as critical thinking. Helping student see that reading is life work is so important! Hi, Lisa! I am happy to see your thoughts here. I haven't written my reflection yet, but you have highlighted many of the areas that also stood out to me. My summer goal has to been to discover how I can enable my students to find the WHY behind their work. My WHY is (and I don't mean to be cliché, I am speaking literally and from my core) make our world a more understanding and compassionate place where we can all live and respect diversity and differing perspectives. Vicky's words of educating our hearts as well as our minds really struck me--- THIS IS IT, THIS is the WHY of reading! I think the examples that Vicki Vinton gives in the book about how to implement a problem-based approach will speak more to our students hearts than approaches that involve isolated skills. Lisa, I love that you point out how reading instruction has seemed to become "oversimplified, prescriptive, and/or authentic". I think in many ways the joy of reading has been put to death for too many children. I am currently discussing Disrupting Thinking with another group and I feel that these two texts speak volumes about how we as educators need to focus on reading for meaning and thinking. The two texts compliment each other well. Love Disrupting Thinking! I agree with so much of what you said! Reading really is about making heart connections, not just remembering facts and summarizing events. I, too, agree with the importance of educating the heart, not just the mind. This is one of the reasons I always love to teach poetry! I think it does help expand a person's heart. There are so many things that have to go into educating the heart! Thanks for your reflection! Teaching poetry can be really fun! You've reminded me that I need to incorporate more poetry into my lessons. So good to "see" you here. "Much of today's reading instruction focuses on teaching students to extract from a text (analyze and find evidence to support claims), but reading is a process of transaction, in which readers engage their minds and hearts in making meaning." I am glad so many teachers are Vicki's book and other powerful ones, like Disrupting Thinking, but these books also need to get in the hands of administrators so they understand, too. I kept nodding my head (yes! yes! yes!) as I read your post. Many of our students appear to be missing out on how powerful and life-changing reading is/can be. It is so true that readers "read for so much more." Enlarging human possibility helps us to consider that nurturing readers is more than just helping them learn to read. As you said, "I want them to read so they can fulfill their curiosities, make sense of the world, and change themselves." Sometimes in our quest for quicker progress, we lose sight of the bigger picture for our students. Taking a problem-based approach opens the door for student agency. I'm glad you are joining us for the second year, and look forward to continued conversation.